If you are in the market for a video baby monitor, you are in luck. Today we are reviewing the Babysense Video Baby Monitor, which is reasonably priced and offers plenty of features that will give you peace of mind when your baby is in their room. You will always be able to check in on them from any other room in the house, even if you are on a different floor. This is a very popular baby monitor, likely because it has so many features and it costs less than $75.Overall, we really like a lot of the things about this baby monitor. Check out our review and see if it may be the video baby monitor for you. The Babysense video baby monitor has a 2.4” high quality color LCD display with enhanced 2.4GHz FHSS technology. This means that you get high-definition video and stable streaming. There is a secure connection that is free of interference, and the sound quality is crystal clear. There is even a two-way, talk-back feature that lets you talk to your baby from another room. This system has plenty of range (900 feet), and you will receive an out-of-range warning if you move too far away.The auto infrared night vision feature lets you see everything in the room, even in the dark, so you can keep an eye on your baby day and night. There are all kinds of other great features as well, which we will go into more detail about next. This Babysense video baby monitor has plenty of features that will help you to know that your baby is safe at all times, even when you are trying to get some much-needed sleep yourself. For instance, if your baby cries out and you are trying to break the habit of running to them every time they cry, you can use the two-way talk-back communication feature. This lets you comfort the baby without having to be right in the same room. You can also use this feature to talk to your partner if you aren’t in the same room.One of the issues we have with this baby monitor is it always seems to be beeping. It needs to have an internet signal, and it beeps until it can find one. Unfortunately, it almost always seems to be looking for a signal, and this can get pretty annoying after a while.Another problem is the fact that even though the manufacturer claims that this system has a 900-foot reach, many users have stated that they don’t get nearly that much. In fact, the alert tends to go off after about 30 to 50 feet. If you are looking for a quality baby monitor that isn’t going to cost a lot of money, this is a good choice. But, for just a few dollars more, you can get other monitors that offer many more features that can really be helpful when you have a new baby in the home. For instance, you can’t be awake 24/7, but you probably still want to see what is going on in your baby’s room. Many other baby monitors have recording features, so you can record up to 12 hours to play back and watch later.The problem with other baby monitors that have more features is that they are also a lot more expensive. If you have a limited amount of money to spend on a monitor, the Babysense video baby monitor is budget friendly, and it has plenty of features that will give you that peace of mind you need when your baby is sleeping. If you have a new baby or have one on the way, one of the things you need to get for their room is a good baby monitor that lets you see and hear what is going on while you are not in the room. The Babysense video baby monitor is a great choice. It is not expensive, yet it provides excellent video and sound quality, as well as many other features that any good baby monitor should have. 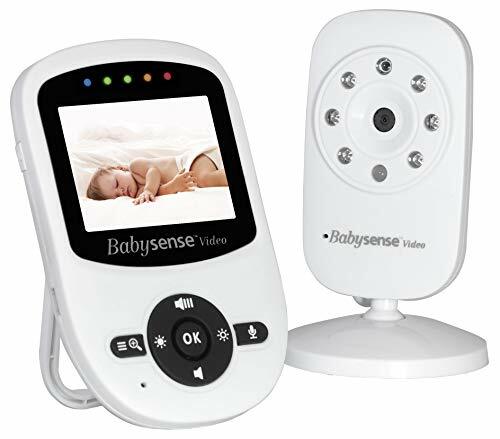 It even offers great infrared vision for seeing in the dark.You could spend a lot more money on a baby monitor that has more features, but this model from Babysense has all of the features that you really need, and a few extra. You will be able to check on your baby from just about any room in your home, and if necessary, talk to them from another room to soothe them back to sleep if they wake up upset and crying.